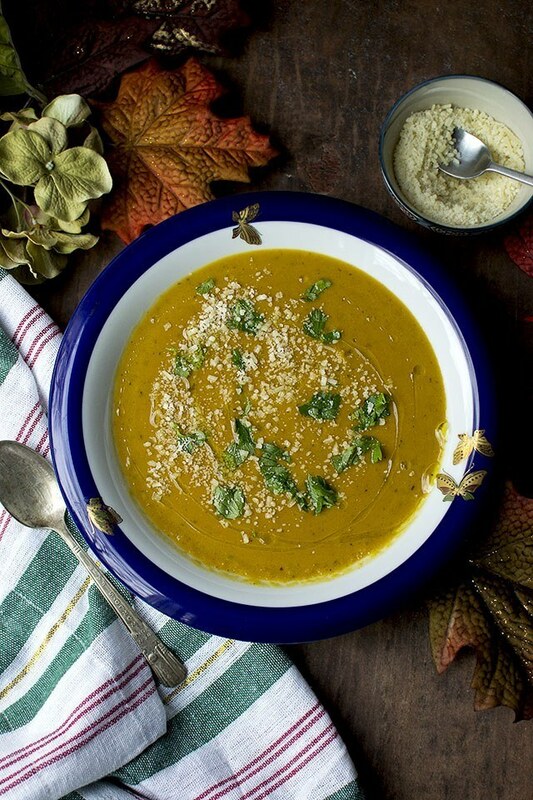 Acorn Squash soup is creamy, flavorful, comforting and hearty. Perfect to make when the temperatures take a dip and you need to warm up inside and out. Cut the ends off the squash, halve it and scoop the seeds out. In one half, place half of the chopped onion and in the other half place the garlic cloves. Drizzle both the halves with 1tbsp olive oil, salt and pepper. Place the acorn on baking sheet and bake for 45 minutes to 1 hour or until very tender and collapsed. Once the squash is roasted, remove from the oven and set aside to cool slightly. When the squash is cool enough to handle, peel the skin off and keep ready. In a soup pot, heat 1tbsp olive oil; add the remaining chopped onion and cook till the edges are slightly getting brown. Add the scooped out squash flesh along with the roasted onion, garlic, herbs, cayenne pepper, vegetable stock, salt and pepper. Using an immersion blender, blend the soup until smooth. Bring the mixture to simmer and cook for 2~3 minutes. Stir in the heavy cream and cook till heated through. Turn off the heat and add 1tbsp parmesan cheese. Mix well and serve the soup hot with parsley, more parmesan cheese and olive oil.